Louisiana is a southern state of the United States of America. It uses the U.S. postal abbreviation LA. The state is bordered to the west by the state of Texas, to the north by Arkansas, to the east by the state of Mississippi, and to the south by the Gulf of Mexico. Louisiana's two official languages are English and French. USS Louisiana was named in honor of this state. Louisiana was long inhabited by Native American tribes before the arrival of Europeans. The lasting mark of the Native Americans can be seen even today in the names used in Louisiana, such as Atchafalaya, Natchitouches (now spelled Natchitoches), Caddo, Houma, Tangipahoa, and Avoyel (Avoyelles Parish). What follows is a partial list, using current parish boundaries as rough approximations of locations. The Atakapa were found in southwestern Louisiana in the parishes of Vermilion, Cameron, Lafayette, Acadia, Jefferson Davis, and Calcasieu. The Chitimachas occupied the southeastern parishes of Iberia, Assumption, St Mary, Lower St. Martin, Terrebone, LaFourche, St. James, St. John the Baptist, St. Charles, Jefferson, Orleans, St. Bernard, and Plaquemines. The Bayougoula, part of the Choctaw nation, were found in points directly north of the Chitimachas, in the parishes of St. Helena, Tangipahoa, Washington, East and West Baton Rouge, Livingston, and St. Tammany. The Houma tribe, was found in East and West Feliciana, and Pointe Coupee parishes; Ironically about 100 miles north of current location of the town named after them. Portions of Avoyelles and Concordia parishes along the Mississippi River were home to the Avoyel, part of the Natchez nation. The northeastern parishes of Tensas, Madison, and East and West Carroll were occupied by the Tunica tribe. The remainder of current day central and north Louisiana was home to a substantial portion of the Caddo nation. The first European explorers to visit what is now Louisiana was a Spanish expedition in 1528 led by Panfilo de Navaez which located the mouth of the Mississippi River. Some 13 years later Hernando de Soto's expedition crossed through the region. Thereafter the region was long neglected by the Spanish authorities, and the next explorers were French. Louisiana was named by the French explorer Robert Cavelier de La Salle in honour of Louis XIV in 1682. The first permanent settlement was founded by Pierre Le Moyne d'Iberville in 1699. The French colony of Louisiana originally claimed a great region of land on both sides of the Mississippi River and north to Canada. Most of the settlement concentrated along the banks of the Mississippi and its major tributaries, with trading outposts and mission settlements in the Illinois Country, as far north as Peoria, Illinois and a number of settlements in the area around near present-day Saint Louis, Missouri. Initially Biloxi, Mississippi functioned as the capital city of the colony; from 1722 on New Orleans fulfilled that role. Most of the territory to the east of the Mississippi was lost to Great Britain in the French and Indian War, except for the area around New Orleans and the parishes around Lake Pontchartrain. The rest of Louisiana became a colony of Spain by the Treaty of Fountainebleau of 1762. In 1800 France's Napoleon Bonaparte re-acquired Louisiana from Spain in the Treaty of San Ildefonso, although this was kept secret for some two years. 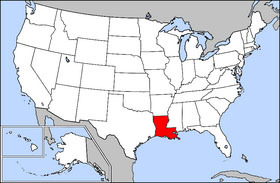 In 1803 the United States of America purchased the French province of Louisiana. 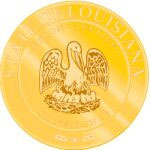 The U.S. divided the newly acquired land into two territories: the Orleans Territory (which became the state of Louisiana in 1812) and the District of Louisiana (which consisted of all the land not included in Orleans Territory). The Florida Parishes are annexed from Spanish West Florida by proclamation of President James Madison in 1810. The western boundary of Louisiana with Spanish Texas remains disputed until the Adams-On�s Treaty in 1819, with the Sabine Free State serving as a neutral buffer zone as well as a haven for criminals. There are still remnants of its former status as a possession of France, including: the use of a civil law legal system, the Napoleonic Code (like France, and unlike the rest of the United States, which uses a common law legal system derived from England), the term "parishes" being used to describe the state's sub-divisions as opposed to "counties", French as an official language (the only state that has French as an official language), etc. In 1849 the capital moved from New Orleans to Baton Rouge. Donaldsonville, Opelousas, and Shreveport have also briefly served as the seat of governments of Louisiana. In the American Civil War Louisiana seceded from the Union on January 26, 1861. New Orleans was captured by Federal troops on April 25, 1862. As some portion of the population had Union sympathies, unusually the portions of Lousiana under Federal control were recognized as a state within the Union and elected representatives who were sent to the congress in Washington, D.C. through the rest of the war. Two separate historically Francophone communities exist in Louisiana. The ancestors of Creoles generally came to Louisiana directly from France or from the French colonies in the Caribbean and settled in New Orleans or in South Eastern Louisiana. The ancestors of the Cajuns are the Acadians, a French-descended people of what are now New Brunswick and Nova Scotia, Canada. When the British won the French and Indian War, the British forced all of the citizens to take a pledge of allegiance. Most Acadians declined and emigrated from Canada, most of them fleeing to the South Western portion of Louisiana, centered in the region around Lafayette. For almost 20 years there was only one amusement park in Louisiana, and it was called Hamel's Amusement Park. The capital of Louisiana is Baton Rouge. Its governor is Kathleen Blanco and its two U.S. senators are John B. Breaux and Mary Landrieu (all Democrats). Louisiana is the only state whose legal system is based on Roman, Spanish, and French civil law as opposed to British common law. Technically, it is known as "Civil Law," or the "Civilian System." It is often incorrectly reffered to as the "Code Napoleon" or The Napoleonic Code. It is important to note that the Louisiana Civil Code and the French Civil Code, often reffered to as the Napoleonic Code, came into existence roughly the same time. Louisiana was never governed by the Napoleonic Code. Great differences still exist between Louisiana Civil Law and the Common Law found in her 49 sister states. While most of the differences are now found in verbage, it is important to note that the "Civilian" tradition is still deeply rooted in all aspects of Louisiana law. Property, contractual, and family law are still mostly based on traditional Roman legal thinking and have little in common with English law. Louisiana is unique among U.S. states in using a runoff in state, local, and congressional elections. All candidates run in an open primary on Election Day, in which multiple candidates from the same party may be on the ballot. If no candidate has more than 50% of the vote, the two candidates with the highest vote total compete in a runoff election approximately one month later. This runoff does not take into account party identification. Therefore it is common for a Democrat to be in a runoff with a fellow Democrat or a Republican to be in a runoff with a fellow Republican. All other states use the First Past the Post electoral system to elect Senators, Representatives, and statewide officials. The Mississippi River empties out of the southern portion of the state into the Gulf of Mexico. There are proposed plans to extend Interstate 69 to the Texas/Mexico border, which will go through north-eastern Louisiana. The total gross state product in 1999 for Louisiana was $129 billion, placing it 24th in the nation. Its Per Capita Personal Income was $23,334, 45th in the nation. The state's principal agricultural outputs include seafood, cotton, soybeans, cattle, sugarcane, poultry and eggs, dairy products, and rice. Its industrial outputs include chemical products, petroleum and coal products, food processing, transportation equipment, paper products, and tourism. As of 2000, the state's population was 4,468,976 including nearly 200,000 native French-speakers. The Charlotte Hornets moved to New Orleans in 2002 - Now known as The New Orleans Hornets.